This painting by local artist Bob Evans was unveiled at Hucknall Library on Monday 4th August 2014 - 100 years to the day after the outbreak of the First World War. 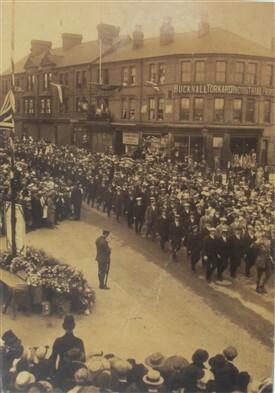 It shows the parade of returned servicemen from Hucknall which took place on 23rd August 1919 and was commissioned by local historian Jim Grundy. The painting was unveiled by Coun. John Knight of Nottinghamshire County Council and will remain on permanent display at the library as a reminder of Hucknall's role in the conflict, and as a tribute to those who did not return. It is hoped that postcards of the painting will also be made available for sale in the near future. Mr Grundy said that, in all, about 1800 men from Hucknall went away to fight in the First World War; only about 1400 returned. 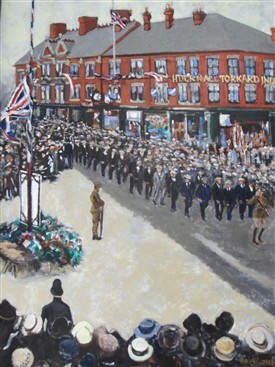 About 1000 took part in the parade shown in the painting which is shown passing the junction of Duke Street, High Street, Station Road and Portland Road. To the left of the picture may be seen a flagpole with trestle tables in front piled with wreaths forming a temporary war memorial. Hucknall's war memorial was finally erected in Titchfield Park after a suggestion that it be in the Market Place had been rejected owing to restictions on space available. Depicted standing before the temporary memorial in the painting is Hucknall man Pte Fred Sears of the Grenadier Guards who served throughout the conflict from 1914 to 1918. Leading the parade, meanwhile, on the right of the picture, is another Hucknall man, Lieut. William Brown of the Royal Garrison Artillery.